Welcome to Palm Springs week on The Editorialist LA! While we love writing about all things LA, we have to recognize that Palm Springs has become an even more popular destination for young Angelenos in recent years. What was once a sleepy retirement community and quiet destination for family vacations, Palm Springs has blossomed in the last few years, welcoming new, boutique hotels, cool restaurants, and even beautiful bars. Of course, it's still a huge destination in April for festivals like Coachella, but more than that, it has become a bigger destination year round (or, when it's not deadly hot to visit) for those in-the-know. This growing popularity is why we've decided to dedicate an entire week to Palm Springs, providing you a comprehensive, in-depth guide for all the cool spots to visit, best places to eat, and where to stay! Palm Springs is a notoriously casual place. Between festival-goers walking around in their cut-off shorts and retirees in their laid-back Sunday attire, most restaurants and events don't exactly boast any sort of upscale dress code. Which is why the arrival of the new Kimpton Rowan fills a big void in the Palm Springs scene. The new hotel is pretty luxurious, boasting a lobby lounge, rooftop poolside bar, and rooftop restaurant, 4 Saints. From Chef Stephen Wambach (whose resume includes stints at some of NYC's top restaurants, gigs around the world, and the responsibility of running the culinary program for the Four Seasons), 4 Saints is a beautiful, modern marvel overlooking the San Jacinto mountains. We had the pleasure of sampling from the Chef's small plates menu, which features global flavors with a Mediterranean flare. When you walk into the bright, open space, the first thing you'll probably notice is a large rectangular bar underneath a modern, geometric light fixture/ liquor shelf. Though the dining experience is the central focus of the evening, the bar is clearly a huge player with its bright, innovative craft cocktails. I started out with The Italian Secretary, an addicting gin drink with refreshing lemon, amaro meletti, and orange bitters. If I hadn't been driving that evening, I could've easily had three. We moved onto the first bite, which was a Hamachi Crudo with tangerine, yuzu, fennel, and dill. I always love hamachi, and this was no exception-- the fish was fresh, sliced into thin but still meaty pieces, and served nice and cold. The yuzu tang paired really well with the fish, while little acidic bites of tangerine kept the dish light and fresh. A beautiful sashimi appetizer that seemed simple, but bursted with unexpected flavors. Next up was definitely one of the most interesting dishes of the night. 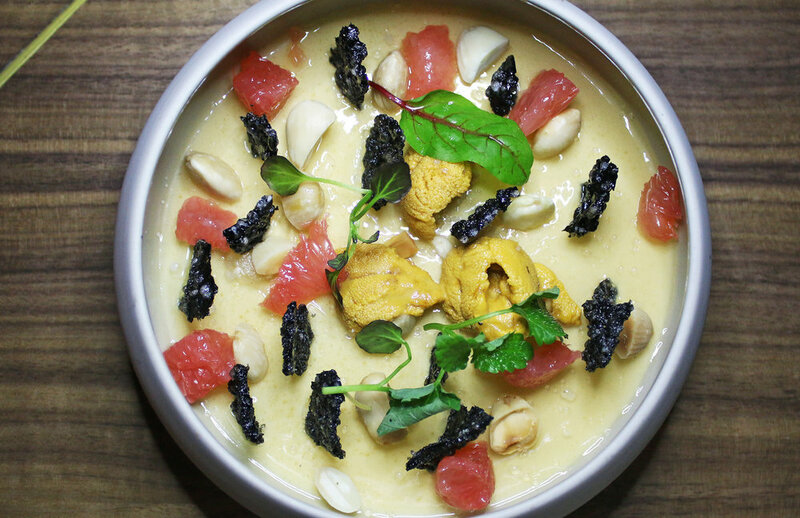 Delicate and creamy bits of sea urchin laid on, what I want to say was a parsnip panna cotta, topped with almonds, grapefruits, and a squid ink crisp. The gelatinous texture of the panna cotta was somewhat similar to the creamy texture of the sea urchin, which really punctuated the dish. Occasionally, uni can be a bit too strong for me, but this uni was really mild and just added some umami and brine to the dish. The squid ink crisps were a really nice crunchy element. It was definitely a dish that was more cerebral in its flavor profile, but I ate every bite. Let me tell you, if every salad came with a heaping pile of truffles on top, I would eat SO. MANY. SALADS. The Artichoke Salad was a really beautiful, earthy combo of artichokes, sunchokes (an entirely underutilized ingredient that I've come to love), miso, and shaved black truffle. The miso broke up the earthy tones with a rich umami flavor, while the crisp bits of sunchoke were really addicting. All together, a really flavorful and delicious dish. How do you follow up so many truffles? With lobster of course! The lobster tortellini was such a fun dish. It came with three very large tortellinis overflowing with chunky lobster. With a simple, tomato-y sauce and some shaved parmesan on top, it was incredibly satisfying. I appreciated that the dish had a bit of chew to it (it wasn't too soft), and the luxe lobster was nicely offset by the sweet and slightly acidic sauce. We wanted to try some meat, so the Chef recommended the Venison, which isn't usually my first choice...but now it might be! The Espresso-Cured Venison was cooked so perfectly and beautifully that it was tender and melted in the mouth. It came with a little bite of house sausage that added even more meatiness to the dish, which was balanced by winter squash and some veggies. It was another great dish, and so well-balanced. Surprisingly, one of my favorite dishes of the night was John Dory, a whitefish that I usually pass on because it never came with a sourdough crust...until now. I can easily say this was the BEST John Dory that I've ever had. So beautifully tender on the inside, with an incredibly delicate sourdough crust that added just a bit of crunch. It was so flavorful, which is saying a lot for whitefish. And I loved the combination of cauliflower, hazelnut, and brussels that came with the dish (which are also usually not my favorite accoutrements). Well done! Finally, we finished off the dish with a massive Crepe Passion, inspired by Chef Claude Troisgros. The crepe was thick, filled with cream, and soaked in a dish of the most deliciously sweet and sticky passionfruit syrup. At this point, we were way too full to finish it, but I wish I'd had the room! Overall, the meal at 4 Saints was really really great. Every dish was thoughtful, well-prepared, well-balanced, and tasty. While it's not necessarily an everyday dinner kind of place, it's perfect for splurging while you're away-- I mean, you're on vacation, right? 4 Saints easily fills a hole in the Palm Springs culinary scene, providing the neighborhood with an upscale restaurant that's as beautiful as the food is delicious. It's incredibly exciting to see how Chef Wambach and his team have truly created a very special, fine-dining experience for Palm Springs.